With new stock always coming into the nursery, it becomes a Tetris-like game of finding space to file away flats of fresh specimens. Making room usually involves a lot of consolidation and sometimes we can get creative in how we accomplish that. 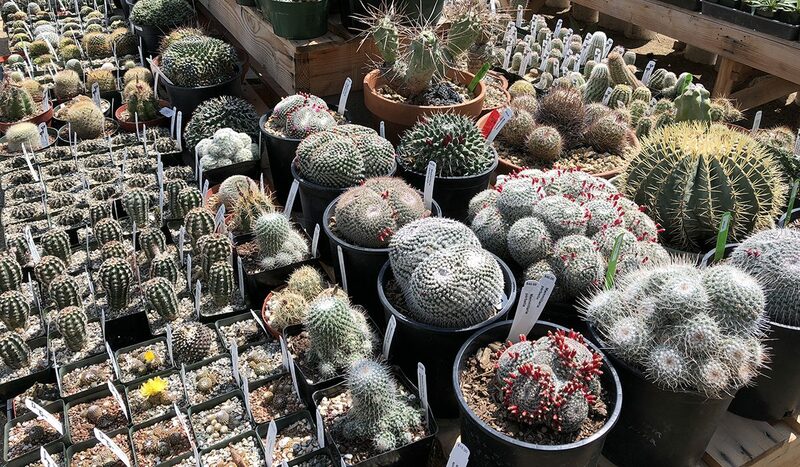 Recently we had to take a hard look at the space being taken up by a few flats of Lophocereus schottii monstrose cuttings rooting in flats of pure pumice. While impressive to see cacti survivability in action, they’re also taking up a lot of real estate in the potting area. The solution? Prepare each of them a custom-built planter of course! We’ll start by taking some of the more disposable flats we have laying around and cut the ends to length, discarding the leftover middle portion. You probably can guess what we’re going to do with the zip ties already…but if not, keep scrolling. I mean Zip Ties, what aren’t they good for? Securing both ends together, we now have a perfectly sized planter to accommodate the cuttings. Don’t worry about the porous bottom, we have a simple solution for that. Voila, we’ve cut a section of fly screen to fit the length and width of the planter. The screen is porous enough for the soil to drain after watering, yet fine enough to keep soil from spilling everywhere. Okay, we’ve got it filled with soil, now let’s pot out first cactus cutting! Despite some scarring, the specimen is in excellent health with a large network of roots having sprouted from the underside. And there you have it! In just a few quick steps and some easily attainable supplies, we’ve created some customized containers perfectly sized for their new occupants. Thanks for your time and attention, don’t forget to check out our Facebook event page for the 2018 LACSS Drought Tolerant Plant Festival!